Why does the protective covering or storm glass over our stained glass discolor or yellow? Why does the protective covering or storm glass over our stained glass windows discolor or yellow? The last one listed "polycarbonate" is type of protective covering that discolors and yellows. Ultraviolet (UV) light from the sun causes it to discolor over time. The most common brand name is Lexan. Lexan polycarbonate is a plastic first created by General Electric. It is a very strong plastic that is relatively light weight compared to glass. It will withstand heavy blows from airborne objects. One church told us that the firemen could not get into the sanctuary through the windows because their axes just bounced off the Lexan. Although polycarbonate is a strong plastic, it is soft compared to glass and some other plastics. Over time, windblown dust and dirt will scratch it, causing the surface to haze in addition to the damage done by the UV light. 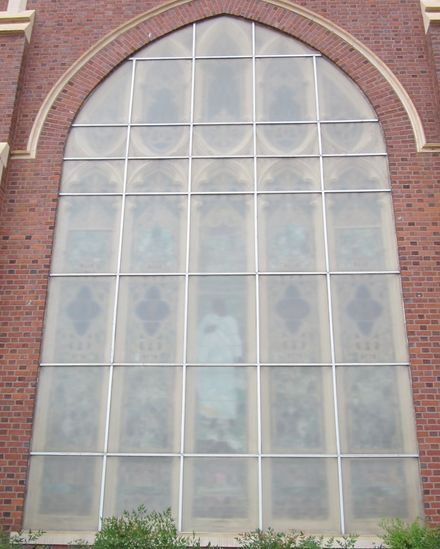 After it was first developed, Lexan was put on many churches up through the mid 1980s. It seemed to be a wonderful solution to protecting windows. But after a few years, it began to discolor and haze. So General Electric came out with a new product Extended Life Lexan (Lexan XL-10) to resist the yellowing and hazing. Extended Life Lexan has a coating of acrylic. Acrylic is a plastic that is harder and helps to block the UV light. Acrylic is a strong plastic, but it is not as strong as a polycarbonate. However, it does not discolor at all, and it is more resistant to hazing. There are different brands of acrylic, but the most reliable and longest lasting product that we have used is 1/4" Lucite. We began using it in the mid 1980s. There are churches from that time that still have it in place, and it is clear. Make sure that you study the photos below. This is an interesting photo. This picture shows Lexan XL-10 installed in all the openings. All of the panels have yellowed, but some have yellowed more than others. The reason some yellowed more is that some of the panels were installed backwards or facing the wrong way. Lexan XL-10 has a layer of acrylic on one side that helps block UV rays and reduce the yellowing. The panels that have less yellowing have the acrylic layer facing the outside. The panels with a lot of yellowing have the polycarbonate facing the outside. In 1985, we were contracted to install Lexan polycarbonate as the protective covering at First United Methodist Church in Ripley, TN. During the installation, a piece of Lucite acrylic was installed in one section in place of the Lexan. 19 years later, the church called and reported that a piece of their Lexan had come off. When we returned to the church, we realized that the "missing section" was the piece of Lucite that had remained clear and in place! BEFORE - This photo shows one of the large windows at the Second Presbyterian Church in Greenville, SC. The window was covered with Lexan polycarbonate which did not allow the stained glass to be seen. AFTER - This photo was taken after the Lexan was removed and the 1/4" Lucite acrylic was installed as the protective covering. Now their beautiful stained glass windows can be enjoyed by all who pass by the church. 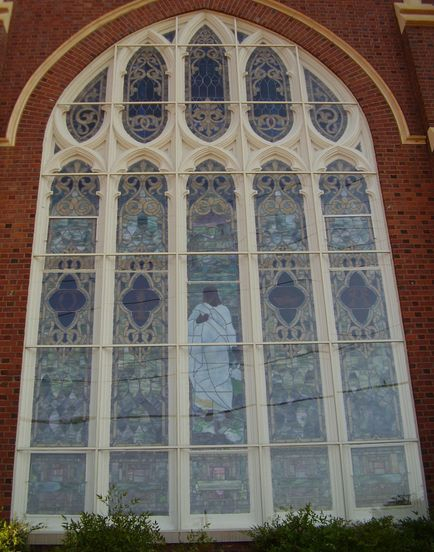 BEFORE - This photo shows one of the large windows at the First United Methodist Church in Cordele, GA. This window was covered with Lexan polycarbonate which did not allow the stained glass to be seen. AFTER - This photo was taken after the Lexan was removed, and the 1/4" Lucite protective covering was installed. Now their beautiful stained glass windows can be enjoyed by all who pass by the church. Call 1-800-820-1292 for more information!